Pygeum is an extract of the bark of an African tree that has been successful in clinical tests over a 25-year period for supporting healthy prostate function (Curr Ther Res 1995;56:796-817). 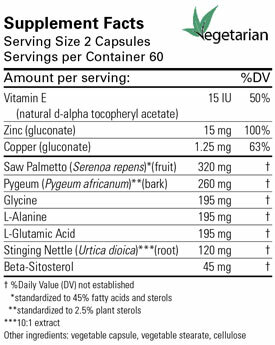 Stinging nettle, often in combination with saw palmetto and/or pygeum, has been successfully used in clinical trials to support optimal urinary flow and prostate function in men (BJU Int 2000;86:439-42; Urologe [B] 1996;36:292-300; Urologe 1994; 334:90-5). 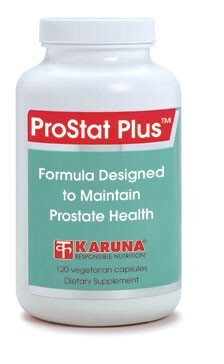 Zinc is important for prostate health, and supplementary zinc may help maintain normal growth regulation in prostate tissue (Cancer Epidemiol Biomarkers Prev 1999;8:887-92; Fed Proc 1976;35:361). Beta-sitosterol has growth-regulating and anti-hormonal properties demonstrated in clinical human studies to support healthy urinary and prostate function (BJU Int 1999;83:976-83; Br J Urol 1997;80: 427-32; Lancet 1995;345:1529-32). Early controlled clinical studies have suggested that the amino acid combination of glycine, alanine, and glutamic acid can support healthy genitourinary function in men (J Am Geriatr Soc 1962;10:426-30; J Maine Med Assoc 1958;46:99-102). Suggested use for adults: Two capsules twice daily, or as directed.